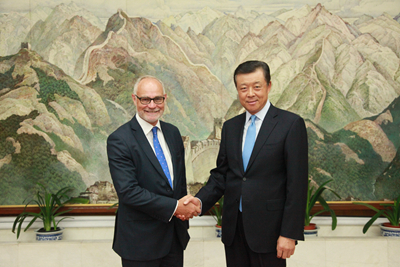 On 11 August, 2016, Ambassador Liu Xiaoming met with Crispin Blunt, Chair of the Foreign Affairs Committee of the British House of Commons at the Embassy. They exchanged views on China-UK relations. Ambassador Liu noted the good momentum in China-UK relations at present. After the UK's referendum to leave the EU and the new UK government was established, China-UK relations faced with a new situation. Both countries should cherish their hard-won and sound relations, and should consolidate and expand their cooperation in various sectors to bring more benefits to the people. He hoped that Chairman Blunt and the Foreign Affairs Committee of the British House of Commons would continue to play a positive role in promoting parliamentary exchanges and relations between the two countries. Chairman Blunt said that as permanent members of the UN Security Council, both China and the UK have important global influence. The development of China-UK relations is in the fundamental interests of both countries, which is also the consensus among the vast majority of the members of parliament. He and the Foreign Affairs Committee of the British House of Commons are willing to work actively to contribute to the parliamentary exchanges and a sound relationship between the two countries.